NEW YORK (AP) Aaron Nola was an All-Star in every facet of the game Monday. The ace right-hander allowed one hit in seven shutout innings and lashed a three-run double that sent the Philadelphia Phillies past the New York Mets 3-1 for a split of their twinight doubleheader. One night after being named to his first All-Star team, Nola (12-2) struck out 10 and won his sixth straight decision to become the only 12-game winner in the National League. With his teammates scuffling at the plate, he took care of the offense himself by doubling his career RBI total in the fifth. So, was Nola more proud of his pitching or his clutch hit? 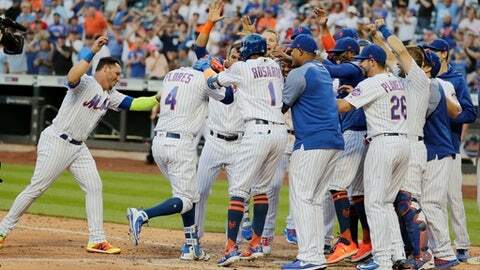 In the opener, Wilmer Flores provided another walk-off win when he connected for a pinch-hit homer in the bottom of the 10th to give New York a 4-3 victory. The teams combined for just four hits in the nightcap, two by Flores. After Flores’ RBI double off Tommy Hunter with two outs in the ninth, Victor Arano struck out pinch-hitter Devin Mesoraco with runners at the corners for his third save . Arano served up Flores’ decisive homer in the first game. Philadelphia, tied with Atlanta atop the NL East, won for the ninth time in 12 games. New York has lost 18 of its past 22 at home. Mets rookie starter Corey Oswalt (0-2) retired his first 12 batters, striking out six, before running into trouble in the fifth. He issued consecutive walks on full-count pitches to begin the inning, then got two outs before Maikel Franco was intentionally walked to load the bases. ”He just kind of lost command there for a second,” Mets manager Mickey Callaway said. Nola lined the next pitch the other way down the right-field line for his second career extra-base hit, giving him six RBIs in the majors and exciting some giddy teammates in the dugout. Before that swing, he was 2 for 35 at the plate this year and an .066 lifetime hitter in the big leagues. On the mound, Nola matched his major league high for wins. He reached double digits in strikeouts for the sixth time in his career and fourth this season. He hasn’t lost since May 20 at St. Louis. After a two-out single by Flores in the first, Nola retired 18 consecutive batters before Michael Conforto walked in the seventh. Those were the only two baserunners to reach against Nola, the lone All-Star selected from the Phillies. The opener was a makeup of an April 2 game postponed by snow. Flores led off the 10th and nearly reached safely on a hit by pitch. In fact, he contended the ball grazed his arm and he started toward first base. When plate umpire Tom Hallion called ball three, Flores motioned toward the New York dugout to request a replay review. The ruling stood following the review – but Flores did one better. He drove the next delivery from Arano (1-1) off the screen attached to the left-field foul pole for his fourth career game-ending homer and second this season. That gave Flores four of New York’s five walk-off RBIs this year and 10 in his career, three more than anyone else in the majors since 2014 and one better than David Wright for the most in Mets history. Flores’ four game-ending homers are tied for the team record. Flores started at second base and batted third in the nightcap. Asdrubal Cabrera also homered for New York in the first game and hit an RBI double off the top of the right-center fence. Franco homered and Nick Williams had three hits for the Phillies, who stranded 12 and went 2 for 13 with runners in scoring position. Tim Peterson (2-1) pitched out of trouble in the 10th, and Robert Gsellman escaped a big jam in the eighth for the Mets. Despite pitching pretty well lately, Wheeler is 0-5 in 13 starts since his last win April 29 at San Diego. That’s the longest stretch without a victory for a Mets starter since 1998. Phillies right-hander Zach Eflin gave up three runs in five innings. He was 6-0 with a 1.91 ERA in his previous six starts. Phillies: RHP Vince Velasquez (bruised right forearm) is expected back from the disabled list to pitch Wednesday night against All-Star ace Jacob deGrom in the finale of the four-game series. … RHP Luis Garcia (strained right wrist) is getting ”really close” to returning, Kapler said. Mets: 3B Todd Frazier was placed on the 10-day DL with a strained muscle in his left rib cage. … The team is optimistic RHP Noah Syndergaard will rejoin the rotation this weekend against Washington, Callaway said. Syndergaard has been sidelined since late May with a strained ligament in his right index finger. … LHP Jason Vargas (strained right calf) allowed one hit over six shutout innings in a rehab outing for Class A Brooklyn. He struck out nine, walked none and threw 49 of 64 pitches for strikes. Vargas also could return to the big league rotation this weekend. Philadelphia recalled LHP Hoby Milner from Lehigh Valley and added RHP Jake Thompson as the 26th man for the doubleheader. … Between games, the Mets reinstated LHP Jerry Blevins from the bereavement list and designated RHP Chris Beck for assignment. Two starting pitchers making their major league debuts Tuesday night. Philadelphia is likely to call up 22-year-old RHP Enyel De Los Santos from Triple-A Lehigh Valley, where he is 9-3 with a 1.89 ERA in 16 starts. New York plans to call up 28-year-old RHP Drew Gagnon from Triple-A Las Vegas, where he is 1-4 with a 4.67 ERA in 17 starts. Gagnon expects to have his parents, fiancee and three sisters in the crowd.